A 20-meter-long T2FD antenna, covering the 5-30 MHz band. 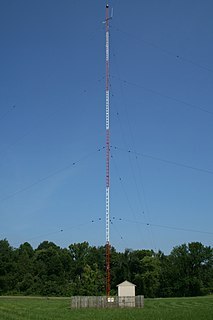 The Tilted Terminated Folded Dipole (T2FD or TTFD) or Balanced Termination, Folded Dipole (BTFD) - also known as W3HH antenna - is a general-purpose shortwave antenna developed in the late 1940s by the United States Navy. It performs reasonably well over a broad frequency range, without marked dead spots in terms of either frequency, direction, or angle of radiation above the horizon. Although inferior in electrical terms  (up to 30% of the RF power is converted to heat in the resistor  ) to antennas specifically designed for given frequency bands, or optimized for directionality, its all-around performance, relatively modest size, low cost, and the fact that it does not require any complex electronic matching to operate with a standard shortwave transmitter, have made it popular in professional shortwave communications. A frequency band is an interval in the frequency domain, delimited by a lower frequency and an upper frequency. The term may refer to a radio band or an interval of some other spectrum. The history of the TTFD antenna divides conveniently into three different phases: It was first developed for use as a general purpose antenna on Naval ships in the 1940s. The design became public in the 1950s and was adopted by radio amateurs, but then fell out of use with the advent of shorter wavelengths and the widespread adoption of low-impedance transmitters and antenna feeds. Recently, with the advent of multiple new frequency bands which are not even-integer multiples of existing bands’ frequencies, it has started to draw renewed attention from radio amateurs. Amateur radio, also known as ham radio, describes the use of radio frequency spectrum for purposes of non-commercial exchange of messages, wireless experimentation, self-training, private recreation, radiosport, contesting, and emergency communication. The term "amateur" is used to specify "a duly authorised person interested in radioelectric practice with a purely personal aim and without pecuniary interest;" and to differentiate it from commercial broadcasting, public safety, or professional two-way radio services. Shortwave listening, or SWLing, is the hobby of listening to shortwave radio broadcasts located on frequencies between 1700 kHz and 30 MHz. Listeners range from casual users seeking international news and entertainment programming, to hobbyists immersed in the technical aspects of radio reception and collecting official confirmations that document their reception of distant broadcasts (DXing). In some developing countries, shortwave listening enables remote communities to obtain regional programming traditionally provided by local medium wave AM broadcasters. In 2002, the number of households that were capable of shortwave listening was estimated to be in the hundreds of millions. Span near a half-wavelength of the lowest required frequency. At least two dowels at the ends are tied to non-conducting ropes, which in turn are tied to supports. The upper and lower ends of the conductors are connected at the ends, by wire sections that follow the end dowels. Fed in the middle of the lower conductor, with an impedance in the order of 300 Ω, balanced, through a standard 4:1 balun. This provides an acceptable all-frequency match to commonly available 75 Ω coaxial cable. Terminated in the middle of the upper conductor with a 400–480 Ω non-inductive resistor, rated to safely absorb at least ⅓ of the applied transmitter power. The resistor absorbs a growing portion of the RF power (either captured from the air or supplied by a transmitter) as the operating frequency nears the lower limit of the design range. The resistor can be built of 3 pairs of 10 serial 1600 Ω, 1 W resistors. The commercially available B&W AC3-30 antenna varies from the above to cover 3 to 30 MHz with a 90 foot length with an 18-inch spacing of the wires. The balun is a 16:1 ratio, thereby transforming the 50 ohm coax to an 800 Ω feed at the antenna. The resistor load is also 800 Ohms, non-inductive. This allows the antenna impedance to swing from 400 to 1600 Ω over the frequency range intended and thus keep the SWR at the transmitter 2:1 or lower. 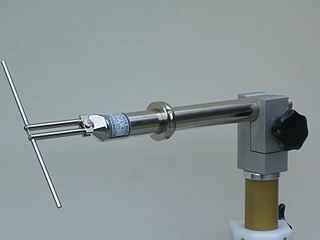 An antenna such as the one described above is usable for both local and medium-long distance communication across a frequency range of about 1:6. For example, an antenna for the lower portion of shortwave (say, 3–18 MHz) will be roughly 33 m (110 feet) long, with conductors spaced 1 m (3.3 feet). For the higher portion of shortwave (5–30 MHz), this antenna will be roughly 20 m (66 feet) long, with a spacing of 60 cm (24 inches). If such long spans cannot be accommodated, smaller antennas will still give adequate receive-only performance down to about half of their lowest design frequency. Transmit performance, however, degrades rapidly below a certain point. Tests done by Dr.John Belrose  showed that though its length is close to a full-size 80 meter (3.5–4.0 MHz) antenna, the T2FD starts to suffer serious signal loss both on transmit and receive below 10 MHz (30 m), with the 80 meter band signals −10 db down from reference at 10 MHz. As a broadband antenna, the T2FD will normally display a reasonably low standing wave ratio (SWR) across its entire frequency range. However, at some frequencies the loading element may be moderately reactive, so the use of an antenna tuner may be needed when using modern solid-state transmitters at anything approaching their rated power output. Also, “low SWR” does not mean high antenna efficiency. This antenna is not recommended for those wanting to make serious weak signal contacts. A dipole cut for the lowest used frequency, fed with ladder line, and matched with an antenna tuner would perform better than the T2FD over the HF region of frequencies. Many ready-made commercial versions of the T2FD are available for the professional,  military, amateur radio, and hobby listening markets. In telecommunications and electrical engineering, electrical length refers to the length of an electrical conductor in terms of the phase shift introduced by transmission over that conductor at some frequency. In radio engineering and telecommunications, standing wave ratio (SWR) is a measure of impedance matching of loads to the characteristic impedance of a transmission line or waveguide. Impedance mismatches result in standing waves along the transmission line, and SWR is defined as the ratio of the partial standing wave's amplitude at an antinode (maximum) to the amplitude at a node (minimum) along the line. A balun is an electrical device that converts between a balanced signal and an unbalanced signal. A balun can take many forms and may include devices that also transform impedances but need not do so. Transformer baluns can also be used to connect lines of differing impedance. Sometimes, in the case of transformer baluns, they use magnetic coupling but need not do so. Common-mode chokes are also used as baluns and work by eliminating, rather than ignoring, common mode signals. Twin-lead cable is a two-conductor flat cable used as a balanced transmission line to carry radio frequency (RF) signals. It is constructed of two stranded copper or copper-clad steel wires, held a precise distance apart by a plastic ribbon. The uniform spacing of the wires is the key to the cable's function as a transmission line; any abrupt changes in spacing would reflect some of the signal back toward the source. The plastic also covers and insulates the wires. A helical antenna is an antenna consisting of one or more conducting wires wound in the form of a helix. In most cases, directional helical antennas are mounted over a ground plane, while omnidirectional designs may not be. The feed line is connected between the bottom of the helix and the ground plane. Helical antennas can operate in one of two principal modes — normal mode or axial mode. Antenna tuner, matching network, matchbox, transmatch, antenna tuning unit (ATU), antenna coupler, and feedline coupler are all equivalent names for a device connected between a radio transmitter and its antenna, to improve power transfer between them by matching the specified load impedance of the radio to the combined input impedance of the feedline. The Beverage antenna or "wave antenna" is a long-wire receiving antenna mainly used in the low frequency and medium frequency radio bands, invented by Harold H. Beverage in 1921. It is used by amateur radio, shortwave listening, and longwave radio DXers and military applications. A loop antenna is a radio antenna consisting of a loop or coil of wire, tubing, or other electrical conductor usually fed by a balanced source or feeding a balanced load. Within this physical description there are two distinct antenna types. The large self-resonant loop antenna has a circumference close to one wavelength of the operating frequency and so is resonant at that frequency. This category also includes smaller loops 5% to 30% of a wavelength in circumference, which use a capacitor to make them resonant. These antennas are used for both transmission and reception. In contrast, small loop antennas less than 1% of a wavelength in size are very inefficient radiators, and so are only used for reception. An example is the ferrite (loopstick) antenna used in most AM broadcast radios. Loop antennas have a dipole radiation pattern; they are most sensitive to radio waves in two broad lobes in opposite directions, 180° apart. Due to this directional pattern they are used for radio direction finding (RDF), to locate the position of a transmitter. A braid-breaker is a filter that prevents television interference (TVI). In many cases of TVI, caused by a high field strength of a nearby high frequency (HF) transmitter, the aerial down lead plugged into the back of the TV acts as a longwire antenna or as a simple vertical element. The radio frequency (RF) current flowing through the tuner of the TV tends to generate harmonics which then spoil the viewing. 1 2 "An Experimental All-Band Nondirectional Transmitting Antenna" by Gil L. Countryman, W1RBK, (W3HH), QST, June 1949, page 54. 1 2 "Performance of the Terminated Folded Dipole" by Capt. G. L. Countryman, (W3HH), CQ, November 1951, page 28. ↑ Belrose, J. (VE2CV). 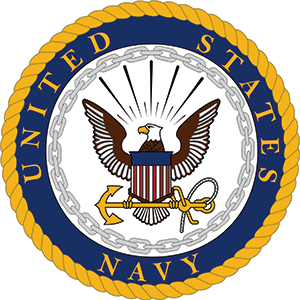 (1994-05). QST Magazine, (May 1994), p 88. "T2FD – The Forgotten Antenna"